What is I Need a Hero? 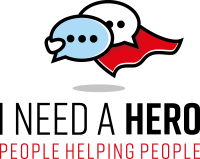 I Need a Hero is an app that allows people in crisis to have secure, anonymous text conversations with a Hero. A Hero is a volunteer who has successfully navigated an addiction or mental health condition and now feels a passion for helping others steer through the same thing. A Seeker is someone going through a life crisis like addiction, depression, or anxiety who seeks help through the experience and wisdom of a Hero. I Need a Hero searches thousands of volunteer Hero helpers to find those who have experienced the same crisis you are facing. It finds the best matches and lists them for you to browse. Read their profiles and personal stories to find the Hero you feel is the best fit. To start a conversation, just click the Start Conversation button the Hero’s profile page. Your text conversations are confidential, and everyone is anonymous. No legal, psychological, professional or medical advice is ever given – but you'll find a wealth of experience, strength and hope. I Need a Hero is real-world help from people who have been there. And it’s free. Yes. I Need a Hero is absolutely free. Anyone 18 or older who needs help can be a Seeker. Heroes helping with addictions need to be sober at least one year. Will anyone know who I am? Never. Everyone is anonymous - both the Seekers and the Heroes. We ask that no one EVER share their true identity. Obviously that could be unsafe. Nope. Conversations are strictly between a Seeker and their Hero. I am a Seeker, how do I sign up? Signing up is simple, especially for Seekers - just enter a User Name and Password, then select the topic(s) you are suffering from. You can enter as much information about yourself as you like, but you don’t have to. However, the more you describe about yourself and your life situation, the more precise the app will be in finding matching Heroes. Do I choose my own Hero? Yes you do. After you describe yourself and your situation, I Need a hero searches thousands of Heroes to find those who match you best, then creates a list of Heroes for you. Browse their profiles and personal stories. Then choose one who feels the most comfortable and start a conversation! What if I don’t like the Hero I choose? That’s no problem. You need to be comfortable with your Hero. If you ever feel uncomfortable, just pick another one from your Hero list. Can I have more than one Hero? Yes, we encourage that. In fact, most Seekers have multiple Heroes. That’s because one Hero may have more experience with a particular situation than another. For example if you had 3 Heroes - Hero #1 may know a lot about teen pregnancy, Hero #2 may have experience with adoption, and Hero #3 know be able to help you with medications. The idea is to have your own support team of Heroes. As with any social media environment you need to be smart and careful about the information you share. Never share information such as your phone number, email address, or where you live. There is a flag button on the text screen for reporting suspicious or malicious behavior to the I Need a Hero community. There is also a rating system for grading how helpful your Heroes are. Will I know my Hero’s identity? I Need a Hero is not designed for emergencies. If you have an emergency Dial 911 immediately. How do I become a Hero? If you have a desire to help others improve their lives, we really want you to be a Hero! Just choose Sign Up and go through the questions to create your Hero profile. As you create your profile, describe yourself really well. The more you information you provide about yourself, the better the app can match you to a Seeker needing help. Be sure to choose ALL the ‘experiences’ you can help with in addition to the main crisis (alcohol, opiates, depression, or anxiety) that you overcame. For example, you may have overcome alcohol (main crisis), but also had to deal with domestic violence and custody issues (your ‘experiences’). You don’t need to be an “expert” on the experiences you list, just that you are familiar enough with them to help Seekers. Do I choose which Seekers I want to help? No. Seekers choose Heroes and initiate the conversations. Can I see the profiles of the Seekers who initiate a conversation with me? Yes. Click the Seeker’s avatar on the top of the text messaging screen to open their profile. Only the Heroes whom Seekers reach out to can read that Seeker’s profile. It is hidden to everyone else. Can I help more than one Seeker? Yes you can. In fact, you will most likely have several Seekers you are helping at the same time. Yes you can. If a Seeker is being malicious or behaving suspiciously, click the BLOCK button on the Seeker’s profile page or the text screen. Manage Blocked Seekers list on your Hero profile page. What if too many Seekers reach out to me? If your plate if full and you don’t have time to help any new Seekers, just choose the ‘Not Taking New Seekers’ button in your profile. Are there things Heroes and Seekers should not talk about? Yes there are. As a Hero, it is important to remember that your role is not to advise Seekers - that job is best left to licensed therapists. A hero’s role is to share their experience, strength, and hope. You and your Seekers should always avoid talking about things that would compromise your anonymity - like your true identity, your location, phone number, etc. If a Seeker brings up things that compromise your role or that affect the safety of either of you, just remind them of the ground rules. An Ambassador is like a Hero's hero - a Superhero! They serve as a role model and supervisor to Heroes. Ambassadors are field representatives for I Need a hero. What is an Ambassador’s role? Ambassadors spread the word about I Need a hero. They recruit new Heroes and are sounding boards to the Heroes in their region. If a Hero is flagged, it is their regional Ambassador’s role to contact them and either offer guidance for handling the situation better, or suggest to the management team that Hero be suspended or cut. Ambassadors must have been an active Hero for 1 year or have helped 50 Seekers. Contact James to learn start the process. To learn more about the INH Ambassador program visit our Ambassadors page.